If you’ve recently bought a Samsung Galaxy S8 or S8+, then you should definitely check out some of the amazing accessories that push the mobile experience further than ever before. One of our favourites is called the DeX Station, which stands for ‘Desktop Experience’. To get started with DeX Station, you need to plug it into a power source. You can’t use any old USB Type-C plug, unfortunately - it has to be an official Samsung charger - so the one that came bundled with your Galaxy S8 or S8+ will do nicely. If you want to use a wireless keyboard or mouse, you need to connect them to the phone first. Open up the Bluetooth settings and scan for devices. You should find your keyboard and mouse in that list, but if you’re having trouble, make sure they’re disconnected from anything else you’ve used them for previously, like your desktop, for example. If you’re not going wireless, there are two USB A ports on the station itself, so just plug them in and you’ll be connected straight away. Use a HDMI cable to connect the dock to your monitor of choice. There’s only one HDMI port on the station, but that’s all you’ll need to get up and running. Once you’re connected, you’ll find yourself faced with a full-scale desktop. Just as you would expect on a Windows computer monitor, there are apps on the left hand side, and a button in the bottom left which will lead to all your apps. You can drag apps from the menu to the homescreen for quick access, and if you’ve got anything open you don’t want right now, they can be minimised with one click for quick access later. 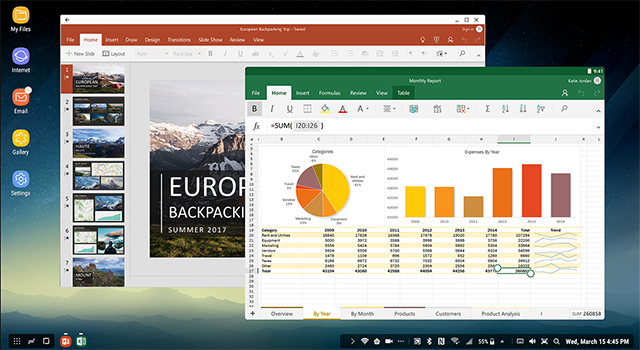 We found the mouse and keyboard worked very well – with little to no difference to using a normal laptop of desktop. Even when typing quickly, the system managed to pick up every letter and space in the correct order. If you’re looking to watch things on the big screen, the DeX station won’t automatically play audio through the screen, but instead plays it from the S8’s downward facing speakers, right into the base of the dock. Which sounds kind of tinny and isn’t really what you want. The DeX station is perfect if you’re always on the go and need a lightweight system that lets you show off your work on the big screen. On the other hand, it’s also a great way of watching films with your mates – just plug in and sit back, instead of crowding round a small screen. 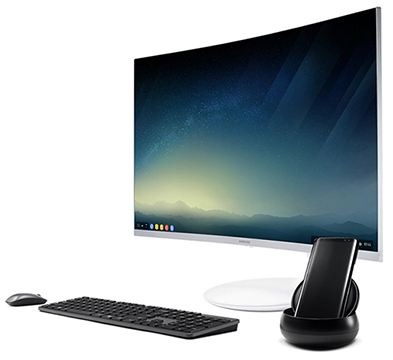 To buy the Samsung DeX station follow this link, or if you're ready to upgrade to the amazing Samsung Galaxy S8, check it out on Carphone Warehouse's website. Got any questions about using the DeX station? Drop us a comment below.